Ato Gemechu Weyuma Lulesa, Director General of the FIC, officially opened the training by welcoming all participants and citing this topics as priority given the Financial Action Task Force (FATF)’s identification of sanctions and asset freezing as an area in need of improvement for Ethiopia. The two expert trainers - Ambassador Curtis A. Ward, Former Expert Advisor and Liaison with Regional and International Organizations for Counter Terrorism Technical Assistance Capacity Building, UN Counter-Terrorism Committee, and Ms. Christine Lee, Former Legal and Sanctions Expert, Al-Qaida and Taliban Sanctions Monitoring Team - then delivered three days of practical training sessions on UN Security Council Resolutions 1267/1989 and 1373, the UN International Convention for the Suppression and Financing of Terrorism, and FATF Recommendations 5 and 6. 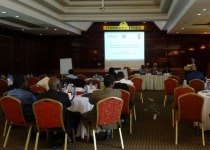 The expert trainers explained the division of the Al-Qaida Sanctions Committee and the 1988 Sanctions Committee; highlighted obligations for implementation and compliance for Member States; outlined the process for listing and delisting of persons and entities and for asset freezing and tracing; and discussed best practices for information sharing between national, regional, and international stakeholders. At the workshop’s close, participants gained an enhanced understanding of the relevant international frameworks on sanctions and asset freezing as well as the processes and procedures for implementation and compliance.